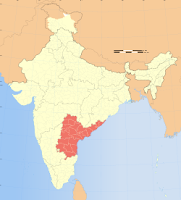 Date of Formation: 1st Oct.1953 Andhra Part A state created from part of Madras. 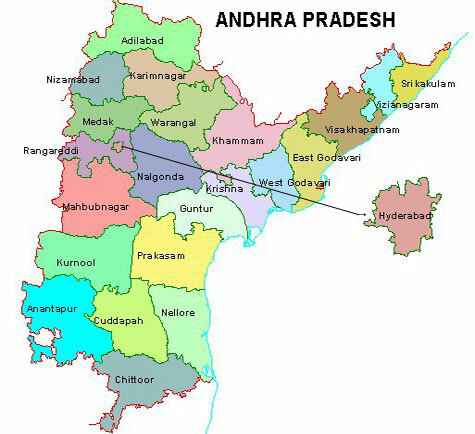 1st Nov. 1956 Andhra Pradesh State formed . Neighbouring States/U.T: Tamil Nadu, Chhattisgarh, Odisha, Karnataka,Maharashtra, Sea: Bay of Bengal. Main Political Parties: Indian National Congresss, Telugu Desam Party, Telengana Rashtra Samithi, Communist Party of India (Marxist), Communist Party of India, All India Majlis- Elttehadul Muslimeen, Bharatiya Janata Party ,Bahujan Samaj Party, Samajwadi Party. Seat of High Court: Hyderabad (Kurnool was the first capital of the Andhra state with the high court of Andhra Pradesh established at Guntur). Chief Languages: Telugu and Urdhu. Major Religions: Hinduism, Christianity, Islamic. Main Towns/ Cities: Hyderabad, Secunderabad, Guntur, Visakhapatnam, Chittoor, Anantapur, Kurnool, Karimnagar, Mahboobnagar, Warangal, Nalgonda, Srikakulam, Nellore, Kadapa, Khammam, Vijayawada, Ramagundam, Machilipatnam, Adilabad, Rajahmundry, Tirupati, Vizianagaram. (a) Rivers: Godavari, Krishna, Tungabhadra, Pranhita, Papagni, Musi, Chitravati, Wainganaga, Banda. (b) Mountains (Mt.Range-Eastern Ghat) Nalamala Hills. Satmala Hills, Erramala Hills, Horsley Hills, Palikonda Range, Velikonda Range. (c) Plateau: Telengana, Golconda, Rayalaseema, Srisailam, Nalgonda, Warrangal, Khammam. (d) Lake: Pulicat, Kolleru, Nagarjuns Sagar, Nizam Sagar. (e) Forest: 63000 sq.km (23%), Coastline: 974km, Staple Food: Rice. Economy: Andhra is called the Rice Bowl of India. Agriculture-occupation of 62% people. (a) Agricultural Products: Rice (77% of foodgrain production) jowar, tobacco cotton, bajra, maize, pulses and sugarcane, castor, ragi, small millets, Other products are cashew, eucalyptus oil, etc. (b) Minerals: Chrysolite asbestos, barites, copper ore, manganese, mica, coal and limestone. (c) Industries: machine tools synthetic drugs, fertilizer, cement, pharmaceuticals heavy electrical machinery, asbestos, watches, electronic equipment, chemicals, glass, etc. (a) Road Length: National highways in A.P.are 4,472 km and State highways covers 10,519km. The total R&B roads: 69.051km. (b) Railway Length: Railway routes cover 5,107km. (c) Main Railway Stations: Hyderabad, Secuderabad, Guntakal, Warangal, Reni- gunta, Vijayaeada, Visakhpatnam. (d)Airporst: Shamshabad (intl), Tirupati, and Visakhapatnam. (e) Ports: Visakhapatnam: 13, Non-major: Kakinada, Machilipatnam. Religious Places: Triupati in Chittoor districts is famous for Venkateswara temple-situated on the hilltop Tirumalai: the temple of Sriramachandraa, Bhadraachalam: the Mallikarjunashwami temple, Shrisailam: the Ahobaala temple, Simhachalam temple and tha Srikurmam temple are other famous temples. Prashanthi Nilayam at Puttapurthi an abode of Sri Satya Sai Baba Lepakshi Mahastupa (Amaravati), Mecca Masjid the largest mosque in southern India is the other attractions. (b) Festivals: Sankranti- Jan (Harvest festival), Visakha-Jan: Shivratri-Feb/Mar, Ugadi:Mar (Telugu New Year), Mahakali Yatra and Mrigasira- Jun/Jul, State Formation Day-1 Nov, Industrial Exhibition-Jan/Feb.